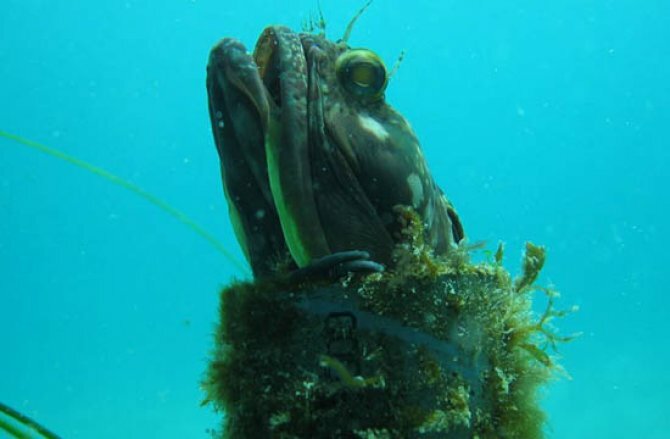 This week's featured species is Neoclinus blanchardi, commonly known as the Sarcastic fringehead. And if you think it's just the name that's weird, check out the amazing video below! The 'fringehead' part of its name is fairly self explanatory, as these fish have soft tissue tentacles on the front of their heads, but as for the sarcastic part, who knows? It seems unlikely that the fish uses harsh or bitter derision in its daily life off the East Pacific coast of California and Mexico, so perhaps the 'sarcastic' name comes from its aggressive territorial behaviour, sarcastic being another word for taunting? These feisty fish spend much of their time living inside old mollusc shells, clam burrows or any other structure that offers them a defensible outpost in their generally otherwise barren sea bed environment. This paucity of suitable homes has led to them becoming extremely territorial when they do find one, and to this end the fish has evolved a truly weird way of sorting out disputes. At first glance these small, (around 30cm/12") fish are rather non-descript, with little more than a couple of bright yellow marks on the side of their jaw to break the otherwise largely cryptic pattern of brown, black and white markings, but when faced with another fringehead interloper on its patch, it reveals a truly weird adaptation. Their upper jaw has loose joints where it would normally hinge with the lower, and a pivot between the two loose sections at the snout allows the fish to rapidly extend their large mouth outwards to form a triangular frill, edged with bright yellow. See this all in action below. This bizarre display is used to measure up with other fringeheads as the two quarrelling fish first compared gapes, and then if unperturbed by the comparative size of each others' chops, a battle will ensue with each fish seeking to push the other back, while engulfing them with their mighty mouths. Females lay eggs inside the male's shell or burrow home which he guards with typical pugnaciousness until they hatch. Why not check out the other Weird fish of the week features?